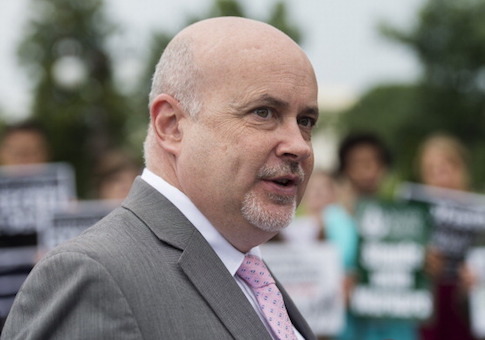 Democratic Rep. Mark Pocan (Wis.) was a no show at an anti-Israel forum on Capitol Hill that he was responsible for orchestrating, according to those present for the Thursday morning briefing, which centered around criticizing Israel. Pocan, who originally sponsored the event anonymously before the Washington Free Beacon disclosed his identity, was not seen at the forum, despite it being customary for members of Congress to personally appear at the events they help organize. Pocan reserved official Capitol Hill space for a forum backed by several anti-Israel groups that support boycotts of the Jewish state. News of the event sparked ire on Capitol Hill and among pro-Israel supporters who saw the event as a propaganda effort aimed at defaming the Jewish state. Despite calls for the event to be canceled, it went on as planned Thursday morning. The forum, "50 Years of Israeli Military Occupation & Life for Palestinian Children," included several speakers known for criticism of Israel and support for the Boycott, Divestment, and Sanctions movement, or BDS, which has been called anti-Semitic in nature. Speakers at the event accused Israel of waging a "military occupation" of Palestinian lands and accused the Israeli Defense Forces, or IDF, of engaging in "torture, beatings, detention without trial, [and] assassination" of Palestinian citizens. Pocan's absence from the event—which was not attended by a single member of Congress— was noticed by those in attendance. "With all due respect, Congressman Pocan is a coward," said one senior congressional official who has been tracking the situation. "If you're going to sponsor anti-Israel propaganda, at least have the dignity to take responsibility for it." "Instead, he chose to facilitate a pro-BDS smear campaign using taxpayer dollars without even showing his face at the event," the source said. "As millions of Jews and non-Jews alike celebrate the 50th anniversary of the reunification of Jerusalem, Congressman Pocan and his J-Street lackeys are spending their time working to undermine the state of Israel." A senior official from a national Jewish organization offered similar sentiments. "This is an event where the speakers very obviously had Jews on the brain," said the source. "They barely bother hiding it. Instead they tried to hide who was behind the event. Not only did the speakers decline to effusively thank Pocan for giving them space, but he was obviously so embarrassed he didn't even show up. " Groups involved in organizing the event included several advocacy organizations that work to undermine the IDF and Israeli government. They include the Defense for Children International-Palestine and American Friends Service Committee, which operate an affiliated advocacy group dedicated to accusing the IDF of various crimes against humanity. These organizations have been cited by pro-Israel organizations and watchdog groups for their promotion of anti-Israel propaganda and false information about the IDF. Rep. Pocan's office did not respond to requests for comment. This entry was posted in Issues and tagged Israel. Bookmark the permalink.